This article is part of a series of recipes suitable for the Medieval season of Lent during which all animal products other than fish were forbidden except on Sundays. I’ll be posting at least one Lenten recipe per week until Easter Sunday (April 4, 2010). 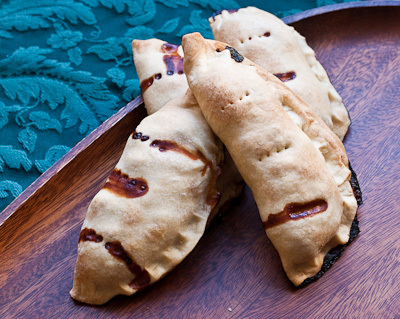 My series of Lenten recipes wouldn’t be complete without an actual Medieval Lenten recipe. 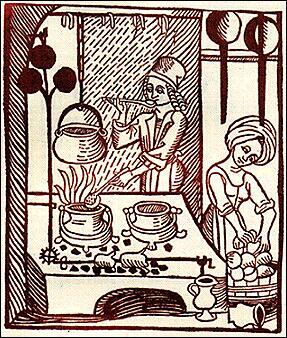 This one comes from a Medieval cookbook called Potage Dyvers (Diverse Dishes) which was written between 1430 and 1440. It is found in the Harleian collection of manuscripts in the British Library. The original is in Middle English, but thankfully back in 1888, the Early English Text Society of Oxford University published a translation, which is now in the public domain. Like most early recipes, it is more an aide-mémoire for a cook who already knows how to make the dish, than a real recipe, providing only a list of ingredients with no amounts, and precious few instructions. Trying to turn recipes like that into something useful for a modern home cook can be challenging and fun, involving lots of trial and error. In this case, I used a redaction done by Cindy Renfrow in her book Take a Thousand Eggs or More, a large collection of 15th Century recipes. The middle English word “rapeye” (pronounced RAP-ee) means a sauce of dried fruits, boiled in wine and spiced. It comes from the old French word “rapé.” It was commonly served with either meat or fish. In this case the rapeye is mixed with fish and used as a filling for pies. Regarding the pastry, the original manuscript says, “Take Dow, & make þer-of a brode þin cake.” or “Take Dough, & make thereof a broad thin cake,” with no indication of what kind of dough. Since this is a Lenten dish, no animal fats could be used to make the dough. Most likely the cook was expected to make a simple dough of flour, salt and hot water, which makes for a pastry with about the same consistency as a rock. It is thought that diners would simply break open the pie and only eat the inside, leaving the tooth-breaking crust behind. I decided to cheat a little and make a dough using olive oil, not a common ingredient in northern Europe in the 15th Century, but which would make the pies more fully edible. It turns out that Lebanese cuisine has quite a few olive oil based pastries, so I borrowed one from the inimitable Anissa Helou. Rapeye requires one unusual ingredient, powdered galangal. You should be able to find it in a shop carrying Chinese, Thai, Vietnamese, or Indian ingredients. I got mine at Kalustyan’s in New York, which does sell by mail order. Galangal looks a lot like ginger, but it tastes sort of mustard-y and sweet at the same time. It is often found in the cuisines of Thailand, Vietnam and Indonesia. If you’ve never tried Medieval food, you might be surprised at some of the flavors. Most of the recipes we have came from great houses whose wealth meant that they could afford exotic spices like galangal which had to come from Indonesia or China. In the same way that rich people nowadays might show off by serving caviar or foie gras, Medieval Lords and Ladies had their cooks dump the whole spice box into the pot. Many spices that we now associate with sweet dishes like nutmeg, clove, and cinnamon were used freely in main courses containing meat or fish. Our fish pies are no exception. The dried fruit makes them quite sweet and the spices used make them taste more like pumpkin pie than fish pie to the modern palate. In fact, I could barely taste the mild fish at all. Who knows, maybe that was the idea, considering how much fish had to be eaten during Lent maybe our Medieval cooks were trying to disguise it. After all, there are no rules against having sweets during Lent. Make the pie filling by simmering the dried fruits in a small saucepan with the wine until they are tender, or about 10 minutes. Remove the fruits from the pan and reserve the simmering liquid. Blend the cooked fruits into a paste using a food processor or blender. If you find the paste too sticky add a little of the simmering liquid and blend further. Put the fruit paste in a medium sized mixing bowl. Next cut the fish fillet into large pieces and blend it to a paste in a food processor or blender. Mix the fish with the fruit paste, add the glangal powder, ground cloves, and crushed peppercorns, and stir thoroughly to combine. Make the pastry for the pies as follows: Whisk the salt and flour together in a bowl, make a well in the center and pour the olive oil into it. Use your fingers to work the oil into the flour until it is evenly distributed. The result will look like pebbles or breadcrumbs. Add the water a little at a time, stirring, until the dough comes together in a ball. Depending on the weather you may not need all of the water, or if the dough is too crumbly you can carefully add a little more (1 teaspoon at a time). Wrap the dough in plastic and let it rest for 10 minutes. Turn the dough out onto a clean, unfloured surface. Knead the dough until it is smooth (about 5 minutes). Divide the dough evenly into 12 pieces, roll each into a ball. Cover the balls with a damp kitchen towel. On an unfloured work surface roll each ball into a 6-inch circle. You may need the tiniest dusting of flour on your rolling pin to keep the dough from sticking, but don’t use much. Fill one half of each circle of dough with the pie filling. Fold the empty half over the filling to form a half-moon. Seal the seams by pinching the dough together about every ½ inch. Use a pastry brush to paint each pie with olive oil, this will aid in the browning process. Pierce each pie 2 or 3 times with a fork to help vent steam during baking. Bake on a parchment lined baking sheet for about 30 minutes or until light golden brown. The pies may leak some liquid as they bake, the parchment will help make cleanup easier.